To be perfectly honest, I have no idea where August went. It does not feel like my last post was almost a month ago! The garden doesn’t even know it’s the end of August and is just now starting to produce zucchini and tomatoes. I’m quite certain unless September is more like August should be I won’t get any more tomatoes and my winter squash will continue to sit there. It is really quite frustrating, but all the gardens in the area have been a little slow this summer because so far we’ve really only had a few weekends of summer weather. On the other hand, my carrots and beets are doing quite well. I just pulled them all up to get ready for the next round that will be ready in early fall. Last summer, which alternately was hotter then hell, I became very creative when it came to making diners that didn’t heat up the kitchen. A stroke of, what I can only consider to be genius, led met to steam beets in my rice cooker on my patio. It takes less time then roasting and even if you use the rice cooker in the kitchen it doesn’t heat up very much. 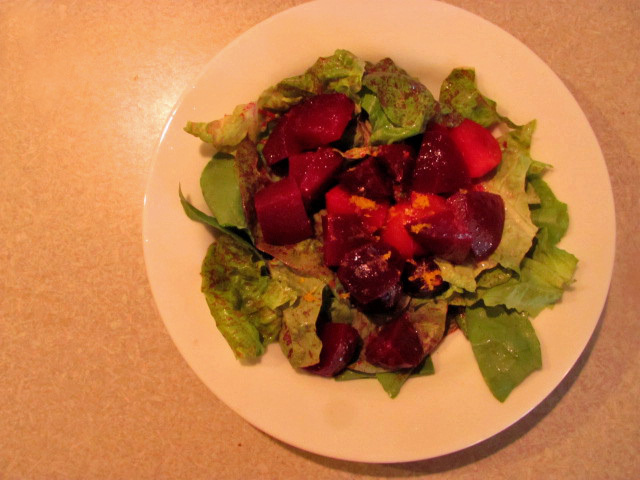 This summer beet salad is quick, simple and one of my favorites. Cut the beets into wedges, unpeeled. (It is easer to peel them ones they are cooked) Fill rice cooker bowl with 2 -3 inches of water (no rice!) and place the beets in the top steam basket. Assemble the cooker with the lid on top. Allow beets to steam until tender, checking occasionally. I find it takes about 30-40 minutes. Remove beets from steam basket and allow to cool. Once they are cool to the touch peel off the skin and cut into bite-sized pieces. In a separate bowl add zest from orange, juice from half of orange and olive oil. Whisk together to emulsify. Add beets and toss to coat. You can either eat it just like it is or add it to a bed of lettuce for a green salad with beets. P.S. I have a month break before fall classes start! I’ve already done quite a bit of cooking and have lots of recipes in the wings so there should be no shortage of cooking, food, and recipes for the next few weeks. After that, well, lets hope my fall isn’t as busy as my summer. 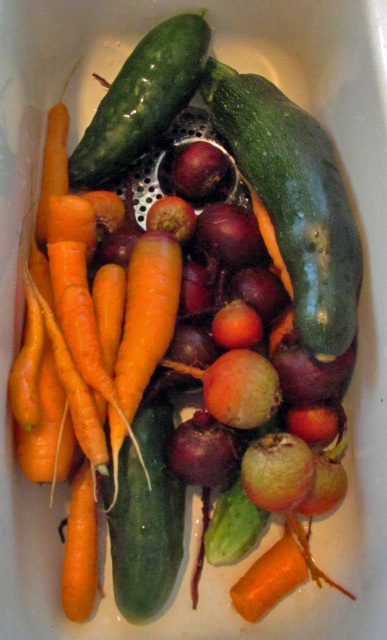 This entry was posted in Farm-to-Table, Garden, Salad, Urban Gardening. Bookmark the permalink.